Released for the first time on CD or LP! This album includes 3 uber-rare 7”s and 3 tracks from recently discovered unreleased tapes. Booklet includes full liner notes, interview, and never-been-seen before images. A mystery to most, Darondo records are high on the wants-lists of many collectors. He is spoken about in hushed-tones by other Bay Area musicians. Back in the day he was seen cruising around town in a white Rolls Royce (with a "Darondo" license plate). He opened-up for James Brown and lived a colorful lifestyle hanging with folks like the notorious Fillmore Slim. Take a listen to these tracks, released for the first time together on an album, and you may agree that he could have been the next Al Green or Sly Stone. But about 25 years ago Darondo disappeared. Releasing three singles in the early 1970s (as Darondo, Darondo Pulliam, or the miss-spelled Dorando) he mixed low-rider soul with blues and r'n'b. He delivered in a variety of styles from the socially-charged "Let My People Go" to the sexually-driven funk of "Legs". All three singles were recorded in the San Francisco Bay Area, and both sides of each of the singles are fantastic productions. "You can hear a little bit of everything," says Darondo about his music style. "There's a little jazz and a little soul. They say if you Black you supposed to have soul. I got Latin flavor in me so there's some Latin in it. Definitely got the Blues in it. I sound kinda' country but I grew up in the Bay Area," he adds. Outside of the music business Darondo was living life to the full, and it eventually caught up with him. “Folks would say ‘Daron got that dough...Daron Do...that’s how I got the name. I used to get my suits tailor made, one of a kind, like my rings. A player can’t have the same ring as someone else. Got my rings specially made with diamonds and stones. But in order to get yourself together you had to get away from all the fastness. I was driving around in a Rolls Royce, I was a fast young man," adds Darondo. Darondo now lives in Northern California with his wife and family and is delighted to hear his music is getting a second wind courtesy of DJs and collectors like the UK-based Gilles Peterson who recently picked "Didn't I" for his "Digs America" compilation. The six tracks from the three original singles are featured here, along with three previously unreleased songs that were recently discovered on a demo reel. The demo reel was sitting in a box of VHS copies of his cable TV shows which we had requested to use for images in the CD booklet. Recorded in the early 1970s, tracks from the demo reel were taken into a San Francisco studio in the summer of 2005 for enhancement. 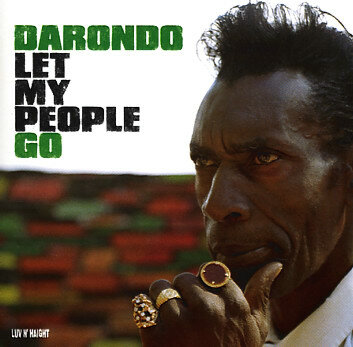 Darondo over-dubbed missing background vocals and guitar parts alongside up and coming San Francisco soul man Bing Ji Ling. Darondo warmed up quickly, he hasn’t lost his touch. After the session Darondo confessed that he was inspired to start playing again...so there is hope for a full-blown Darondo revival!